Todd and Rick Kelly are pleased with the steady improvement in form of Jack Daniel’s Racing entering the ITM400 Hamilton in New Zealand this weekend. Rick Kelly scored a second place finish at the last points race held in the 2011 V8 Supercars Championship, the Sunday race at the Clipsal 500 in Adelaide. That finish followed strong pace from the #15 Jack Daniel’s Commodore in the Saturday race, where Rick was unlucky to miss out on a podium finish. Todd Kelly scored a fifth place finish in the final race of non-championship Albert Park 400 in Melbourne two weeks ago aboard the #7 Jack Daniel’s Commodore. Race 3 at Albert Park followed fourth and fifth place finishes for Rick Kelly in the opening two races of the event. With both recent results and improved car pace pointing to huge potential ahead of this weekend’s two 200-kilometre races at the Hamilton street circuit, the Kelly brothers will be racing hard to score more podium’s for Jack Daniel’s Racing in New Zealand. “I’m looking forward to New Zealand and not just because it’s a great event,” said Todd Kelly. “Between the four of us at Kelly Racing we have four good chances of getting a podium, including my #7 Jack Daniel’s Commodore. “At the last couple of events we should have had one of the cars on the podium at every event, including the Grand Prix. “So it will be on for young and old between Murph, Reynolds, Rick and I. We’ve all got very similar car set-ups now so we can learn and help each other, as well as try to beat each other. “The team is really good, I’m happy with how everything sits. The point that we are at now, in terms of the pace of our four cars and the progress that is coming from our drivers and engineers, I would not have expected us to be at until probably six or seven events into the season. “Murph often turns into a bit of a magician when it comes to New Zealand, especially all those years at Pukekohe,” said Todd Kelly. “He’s certainly got the momentum to go there and give the joint a pretty big shake up. “Jumping into the older chassis is actually quite exciting because it is a new motivator for me,” said Rick Kelly. “I’m going to wring its neck and see how we go getting a good result from it now that it’s been painted up as my #15 Jack Daniel’s Commodore. “It’s a race winning chassis so running it doesn’t phase me whatsoever. “We use soft tyres in Hamilton. If we were going there on hard tyres I would be very confident of going there and getting a result in the top few positions. I think the car we’ve got now on hard tyres is really strong. We proved that at Adelaide and the Grand Prix when we were on hard tyres. 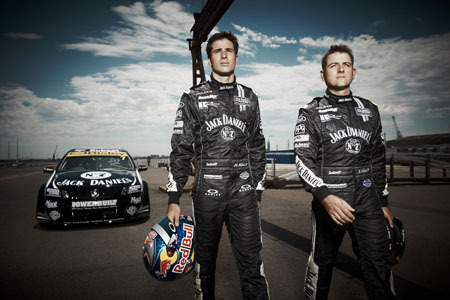 “New Zealand has always put on a good event, even the Pukekohe rounds over in NZ were all very good,” said Rick Kelly. “I won the last race there at Pukekohe, which is a nice thing to have on the CV. “Last year at Hamilton we were fighting for third place and a pit stop drama cost us a chance for a podium. “The guys are doing a great job with the pit stops at the moment so if we don’t have any dramas we should have some good pace there again. “We are a different team to what we were at the start of the season, one that is a lot stronger for sure, which is very exciting, but that also creates a bit of an unknown as to how we will go when we roll the cars out of the truck. “Murph didn’t have a good time last year and I think that has knocked his confidence around a little bit,” said Rick Kelly. “He’s had a great attitude with us all year and he’s been trying to fight back to be his old self. “To be honest, in this game, everyone knows you are only as good as your last race, and he was second on Sunday at the Grand Prix and had genuine pace to finish there. “For us that was very, very exciting. He drove really well and got the most out of the car. “I would say that Murph’s back, which is great. “We are going to a round in New Zealand where we know he gets the best out of himself each year. The Pepsi Max car looks great out there on the track, it’s handling very well, he’s got a good group of guys behind him and they are all the key ingredients for a very, very strong result.